A clinical performance saw India sail to a 34-run win against New Zealand in the opening match of the ICC Women's WT20 on Friday. A clinical performance saw India sail to a 34-run win against New Zealand in the opening match of the ICC Women’s WT20 on Friday. Chasing 195, New Zealand managed 160/9 in their 20 overs at the Providence Stadium in Guyana. After captain Harmanpreet Kaur became the first from India to score a century in women’s T20Is, the spinners took the centrestage as New Zealand kept losing wickets regularly. Opener Suzie Bates waged a lone battle with 67 off 50 while Katey Martin struck 39 off 25 but that wasn’t enough as debutant spinner Dayalan Hemalatha and Poonam Yadav took three wickets each, not allowing the opponent batters to settle. However, New Zealand began their chase brightly with the opening pair of Bates and Anna Peterson (14) adding 52 runs. The introduction of Hemalatha in the seventh over changed the scenario as she got India their first breakthrough in Peterson right after the end of Powerplay overs. From thereon, the spinners took control. New Zealand needed a big partnership like India who were powered to a record-breaking total of 194/5 thanks to a century stand between Harmanpreet and Jemimah Rodrigues after three early blows. New Zealand’s hopes rested on Bates who clattered eight fours during her stay before Arundhati Reddy landed the sucker-punch by having her caught in the 14th over. Hemalatha (3/26) and Poonam (3/33) were the pick of the bowlers while Reddy chipped in with 2/31. The pressure of a high-scoring chase got to the White Ferns and it was largely thanks to Harmanpreet’s 103 off 51. Her record partnership with Rodrigues, worth 134 runs for the fourth wicket, pushed India to WT20’s highest ever total after she opted to bat. Her innings was loaded with seven fours and eight sixes. Rodrigues, who came in to bat after Taniya Bhatia fell for 9 in the second over, scored 59 off 45. India lost three wickets with New Zealand pacer Lea Tahuhu removing openers early. Bhatia started well with two fours but was beaten by pace to be bowled off the first delivery from Tahuhu. Smriti Mandhana then fell after a stunning catch from Hyley Jensen in the deep to hand Tahuhu her second wicket in as many overs. The wicket of Hemalatha (15) left India in a tricky spot at 40/3. 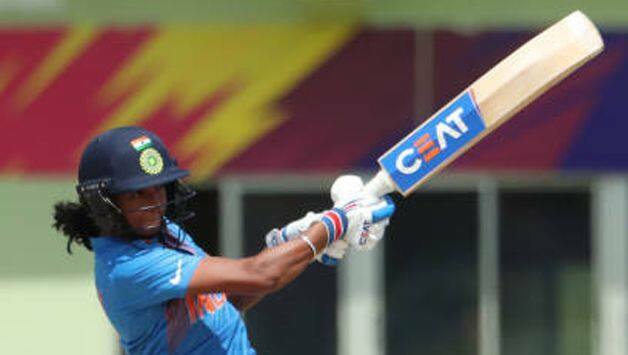 However, Harmanpreet and Jemimah then began the repair work collecting regular boundaries to negate the early advantage. Harmanpreet was in dangerous mood, beginning in ominous fashion, recording the first six of the tournament in the 10th over. 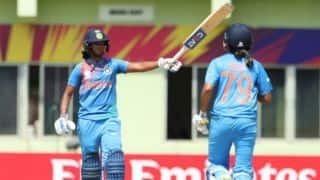 India were 76/3 at the halfway stage but with Harmanpreet and Rodrigues settling in, as they went on to plunder boundaries at will in the second-half of their innings. India struck 118 from their final 10 overs with Harmanpreet being dismissed off the penultimate delivery. Martin did clatter eight fours in her score of 39 after coming in to bat at No. 6 but that proved too little too late.